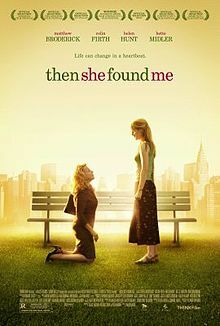 A lot of ills come from being in the wrong place at the wrong time, and Helen Hunt provides an example in the 2007 film “And Then She Found Me,” based on Elinor Lipman’s 1990 novel. 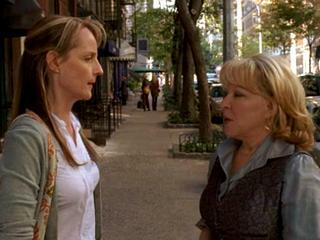 The film was produced, directed, and written in part by Helen Hunt, who also plays the “me” in the title. Perhaps she was having trouble concentrating. The premise of this dour property that is passed off as a “romantic comedy” is that 39-year-old April Epner’s adoptive mother has died — shortly after denying April’s charge that mom had favored her biological son. This comes on the heels of the collapse of April’s marriage to Ben Green (Broderick), who abruptly gives her the “I just can’t do this anymore” routine. Ben hasn’t cooled off too much to have a last barnyard fling with April on the kitchen floor, and that provides the delicate nuance of an awkward pregnancy — hers, not his. April doggedly goes on with her career as a Brooklyn schoolteacher, which puts her in contact with Frank (Firth), the conveniently divorced father of one of her pupils. Frank, a sandy-haired teddy bear, has the earthy charm of the British Isles about him, and the romantic sheen of an unemployed and, one presumes, unappreciated writer. He isn’t too charming or romantic to resent the fact that Ben, thanks in part to the pregnancy, still has one foot in his relationship with April. As though April’s life weren’t interesting enough, a messenger comes to a school with a letter in which a woman who does not identify herself at first claims to be April’s biological mother. The woman turns out to be daytime television talk-show host Bernice Graves (Midler). April is skeptical about Bernice’s claim, infuriated by her badly contrived lies, and put off by her overbearing attempts to play mother. If the resolution of this tangled tale seems satisfactory, it may be only because the resolution means the film is over. It’s kind of like a cricket match in that regard. Clearly we’re supposed to find humor somewhere in this story, but there is none. There certainly is none coming from Hunt, who can be described only as grim. Incidentally, in the scenes in which April and a shifting cast of companions visit the gynecologist, the doctor is portrayed by Salman Rushdie. I read somewhere that Hunt recruited him because she wanted to make sure all the major faiths were represented in a scene in which there is prayer. I’m not sure which faith he represents. Hunt didn’t take the hint when she was turned down by the studios before making this film herself on a shoestring budget. Broderick, Firth, and Midler agreed to work for scale, which seems appropriate. If they had accepted their usual salaries for this film, their names should be on the placards in Zuccotti Park. Oh, never mind the film. I thoroughly enjoyed your review. Hitting the whole spectrum from tongue-in-cheek to acerbic’s quite a feat in such a short piece. Thanks for the fun!